We would all like to live a more environmentally friendly life these days. However, it was only when I worked out my carbon footprint and nearly fell over in shock. I did some research and found out how easy it is to live a green life. Anyone can make these changes I have done, and a few I am working on soon. Many of the tips in this book will not only make you or your business green, but save you money too. We all know deep down what is harmful to the planet and what isn’t. Our stressful modern lives sometimes make it difficult to pay enough attention to this. The rest will follow naturally. Think about the amount of what you use when you shower. Do you turn the water off when you brush your teeth? Where does the trash go after the garbage truck picks it up? Start to think about being green. There are many fun ideas which can make your life more interesting and more environmentally friendly. I have found that going green is more entertaining now I have a child to teach. We can compost, garden, and save water in the bath tub together. She enjoys the challenge. Living in a house with more insulation with lower your electric bill and save the earth. The insulation may also soundproof each room better. The noise pollution in and out of your house may go down with good insulation. If your home isn’t well insulated then the heat you produce in winter time is probably leaking out all over the place. Try to save electricity and money off your electric bill by unplugging devices when you are done with them. For example your cell phone. These strips will turn off the other electronics when the main one is turned off. For example, if you turn off your television, the dvd player, cable box, and wii will also turn all the way off. We have one on our main television, and one on my husbands “high power use” computer. If you don’t already have energy efficient light bulbs in your house then now would be a good time to change them. These light bulbs need to be changed less often. Research the color lights to buy before you purchase them at the store. Some give off a bluish or white tint that you may not like. This is a bit of an expensive one but it could be a money saver in the long run. Old appliances such as dishwashers, freezers and boilers tend to be very energy inefficient. Modern ones will stop you wasting so much energy and this could mean that they pay for themselves over time. Before we moved in to the house we currently live, we donated our old appliances, and got a new refrigerator, oven, and microwave. These are more efficient than the old ones. Luckily, my husbands Uncle took the old stove and fixed it up for this cabin. This means the temperature of our houses changes for when we wake up, when we leave for work, when we come home, and when we go to bed. You can change the thermostat in your house by just changing a couple wires. We bought our new thermostat at Lowes for about $30. We then got a rebate for the full $30 from our electric company. Check on your electric company website for rebates. Just think of all those millions of empty plastic bottles all across the world from plastic drinking water bottles. Only a small amount of bottles get recycled. You could either use a reusable bottle or filter your own drinking water. I thinkthese bottles look nice too. You can choose from many different materials. This is an incredibly interesting way to get around. Bicycling will keep you fit. Wish a bicycle you will save expensive gas. As you pedal along you will see more of your surroundings and feel more in contact with the world. If you bicycle to work you may want to bring an extra pair of clothes. If you live within walking distance of your work then leaving the car at home even just one day a week can make a difference. I love walking and if you can go through a park or choose alternative routes each time it will be even better. You can walk to get ice cream with your family or the local park. All that junk mail which gets delivered each day is a real pain but also bad for the environment. When you do get junk mail make sure to recycle. You can stop these unwanted letters from hassling you and cut down on paper wastage by getting your name taken off mailing lists. These days there are recycling options for just about everything. My first step before throwing something out is to work out if I can adapt the object for another purpose. If I you can’t then understand how I can get it recycled locally. View the local recycle website. Understand what number plastics you can recycle. You do not need a farm or be a farmer to grow your own food. Start a window box or a small garden outside. When children view the vegetable and fruit growing them will be more interested in eating the food too. You will know what soil the food grew in and that you did not use pesticides in your own garden. This food has less of an environmental impact because there is less travel time and less gas used. Our house now has lights that turn off and on automatically in the kitchen and bathrooms. We also have a dimmer on our kitchen light. These definitely save electricity, and are nice to have too. Get a plastic container for outside. Poke some holes in it. Add dirt until about 1/8 or more full. Get a plastic container inside that seals so your kitchen does not smell. Put that one under your sink. Add contents to the container in the kitchen. If you are unsure what to add check online. This has helped me be more aware of what I eat. If you always wash your clothes in warm water then you should stop to consider whether this is necessary. The majority of clothes can be cleaned just as well in a washing machine with cool water, which makes for a significant energy saving over time. When we moved into our house we needed a shed light to illuminate the back yard. We choose a solar powered one. For less than $30 we did not need to wire the light or use electricity. I do admit, we did loose the solar panel in a hail storm, but our home insurance company helped pay for a new one. By collecting rainwater you can water your plants. You can also wash your car with this water that probably has less mineral than your tap water. Then you will not have hard water spots on your car. Put any kind of bucket under your downspouts. The larger the barrel the more you will collect. Start using paper more efficiently and write or print on both sides. If you have a recycling box at your home or office you can reuse the paper before you recycle. 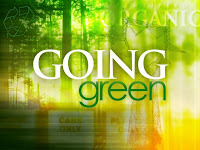 To read all 50 tips view 50 Things to Know About Going Green eBook. A great book for someone who would like to take steps to saving the planet and money. I ENCOURAGE YOU to borrow the book for free from the Kindle Lending Library for Amazon Prime Members. If you would like to share these tips please email me at lbrennec@gmail.com.